This site celebrates the unique art of inked impressions made from fish. Please visit the galleries to see the artist's use of gyotaku to explore and portray various realms, including natural history, conservation, philosophy, and human culture. ~Thank you and enjoy your visit! Now Available!! ~Check out the Giclee prints in our Online Store. Visit our facebook page to leave your comments. 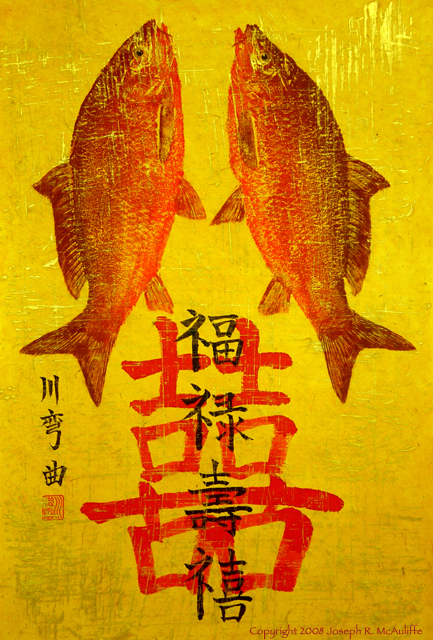 In Chinese culture, a pair of carp symbolizes abundance, harmony, and marital happiness. This print is the perfect gift for either newlyweds or those happily married for a long time. Order your print here. Happy Valentines on February 14!! Happy Chinese New Year on February 19! !